The past year has seen a variety of birds visit the backyard. 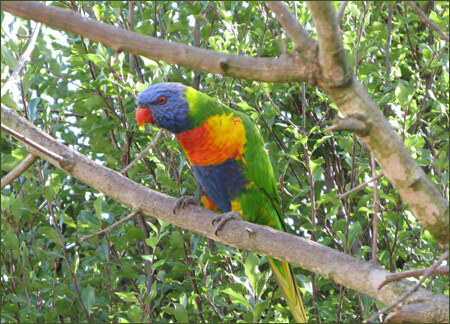 The Rainbow Lorikeets are now regular visitors and seem to be quite fond of the bird seed we put out for the galahs, doves and other visiting parrots. 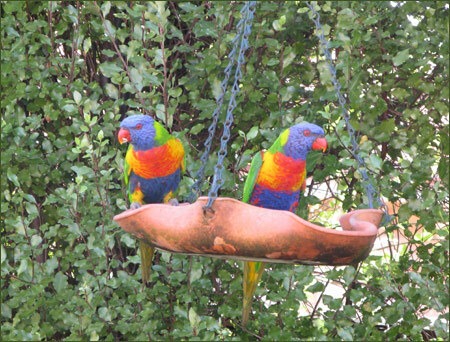 In fact, they are rather bossy and will drive the galahs away from suspended bird feeder. 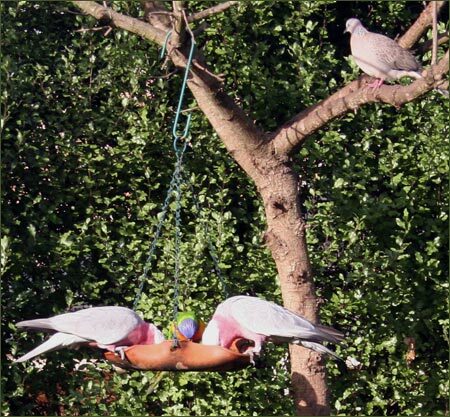 It is a rather comical sight – lorikeets in the feeder, galahs on the nearby pool fence (making plaintive chirping sounds) and doves waiting (not so) patiently on the branches above the feeder. 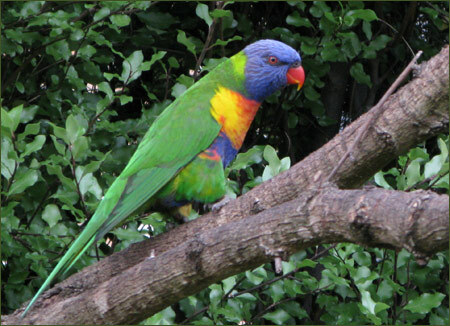 Lorikeets are nectar and pollen eaters but they also eat fruits, seeds and some insects. The tips of their tongues have tiny hairs, a bit like a brush, so that they can get the nectar out of flowers more easily. I don’t think they consume too much seed when visiting which is my biggest concern. We tend to put seed out only if they stop by and call to us. It is easy to see how their name came about. 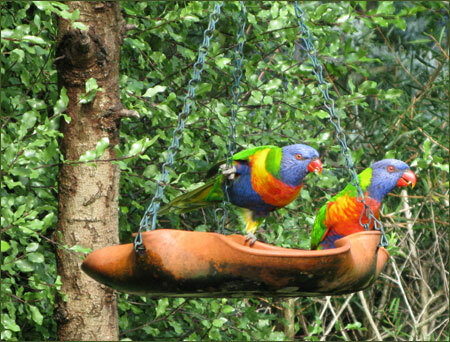 They really do look like a rainbow with their colourful green, blue, purple, red, orange and yellow feathers. Usually just a single pair visit. Sometimes one will keep watch while the other eats, especially when Whisper the cat is lurking about. The birds are most comfortable when I sit outside with a cup of tea and keep an eye on the dog and cat. They seem to enjoy my company and our shared snack time. My colourful friends allowed me to get a little closer than usual for these pictures. There have been times when 3 or 4 pairs of birds have been in the backyard at the same time. It is hard to know whether or not our regular visitors are the same pair or just another from the same local group. 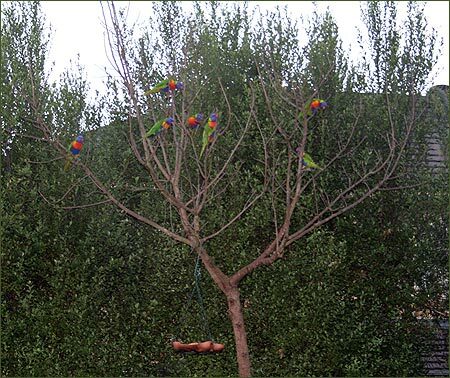 The tree with the hanging bird feeder inexplicably died last Spring so it looks very shabby except when it is decorated with Lorikeets! We call it the bird tree. On one occasion the dove count in that tree was 12. Sometimes parrots and doves are willing to share the feeder but it is a rare thing to see Lorikeet and Galahs sharing the same dish as shown below. The poor dove is patiently waiting for his turn.